My interest in The Three Investigators goes back to the Fall of 1975 when I was in the First Grade. 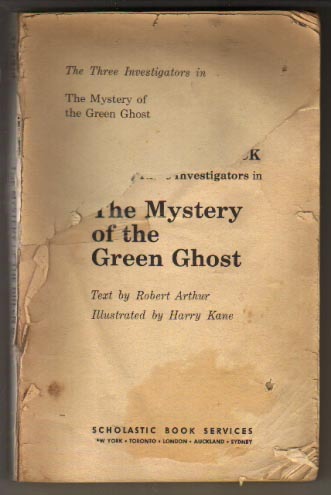 A classmate came to school one day carrying a very ragged, large-sized Scholastic copy of The Mystery of the Green Ghost with the covers missing. Despite the condition of the book and the fact that it looked like something for older kids, I was absolutely enthralled by the fantastic black and white Harry Kane illustrations and felt that I HAD TO HAVE THIS BOOK! I traded some trifle such as a pencil or an eraser to own the book. I remember struggling through the rather long Alfred Hitchcock introduction during recess and then tackling the first chapter on the bus ride home that afternoon. Looking back, the reading level was at least a year or two ahead of me and I undoubtedly didn't understand many of the words but somehow the writing of Robert Arthur was able to make quite an impression on me. Boy, was that an intense read for a 7-year old! That night I dreamed of a "white" ghost and a creepy, broken-down old house. I woke up and tried to get in bed with my parents. The next morning my mom looked at my new book with disdain and threatened to throw it in the garbage (it actually looks as if that is where it was found to begin with) if it caused me any more problems. It took me several days to finish the book and it wasn't until a year or two later that I discovered that there were more Three Investigators books at the local library and I read all that could be found. Today that old, beat-up book (looking much as it did in 1975) holds a place of honor in my Three Investigators collection. 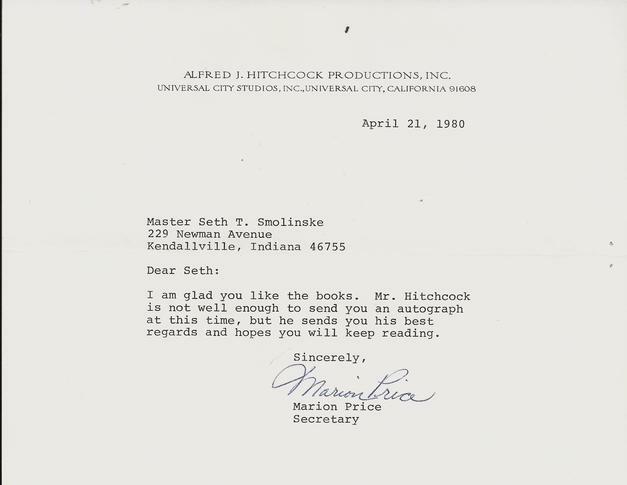 Unfortunately, Alfred Hitchcock died on Tuesday April 29th, 1980 a few days after I received this letter. I continued to buy Three Investigators books over the years as new titles appeared but they somehow seemed to have lost some of their luster without Hitchcock and the wonderful internal illustrations or maybe I was just too old for them by this time. I stopped buying the books at #40 The Mystery of the Rogues' Reunion. 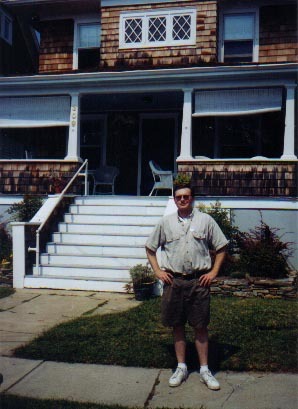 Flash forward to the Summer of 1995. My wife and I are on vacation and at an antiques show in Centreville, Michigan where I am pawing through a box of old books not really looking for anything in particular. Suddenly my eyes light up as I see something I've not seen in a long time: I have just found a nice matte cover hardbound trade edition of #5 Alfred Hitchcock and the Three Investigators in the Mystery of the Vanishing Treasure. I eagerly pay the dealer his $3.00 asking price. I am not known as a "talker" but for the next few hours while my wife drives the car, I re-read my new book and chatter excitedly about The Three Investigators and what they meant to me while growing up. The conversation is one-sided as I relate the numerous neighborhood adventures my brother, friends and I had pretending to be The Three Investigators: the haunted house we had with several exhibits based on scenes from Terror Castle, my Halloween costume based on Sinister Scarecrow, and on and on. My wife smiles and nods good-naturedly, amused by my unusually loquacious and enthusiastic manner as I attempt to acquaint her with The Three Investigators, whom she had never heard of before. The collection of Three Investigators books that my brother and I had assembled so many years before and which consisted primarily of various paperback formats and glossy cover hardbound trade editions was still sitting intact on a shelf in my parents' house. But my new goal was to collect the entire series in hardbound First Printings. I quickly found out that there were three final titles in the original series that I didn't know existed and that a newer spin-off series, Crimebusters, was also something to watch for. Before accomplishing my first goal with the hardbound books, I had already decided that I would like to obtain every Three Investigators title in every possible U.S. format and also collect anything else that might be available to a collector pertaining to The Three Investigators - including its history and background. Thus began my passion for collecting Three Investigators books, history, and related ephemera. I almost dread the day when my collection might actually contain everything and anything that is possible to collect related to The Three Investigators. Fortunately, something new or unknown seems to be consistently popping up when least expected which helps to keep the passion fresh and alive. I also have a growing collection of other Robert Arthur-related material which is gradually being incorporated into this site. Since 1995 I have bought and sold thousands of Three Investigators books in all formats as I continually strive to upgrade my collections to contain the best examples possible. Despite my efforts, I still have a little way to go to achieve the ultimate Three Investigators collection. It sometimes seems that the most common of Three Investigators titles in near-mint condition can elude the collector for years while it often happens that some of the rarest items will come his way regularly and seemingly without effort or high cost. There is still much to be learned and discovered about this series. I am hoping that anyone who visits this site finds it useful, informative and entertaining. Perhaps someone who visits here may have some interesting connection to the series. For example, maybe you know someone who worked for Random House on this series, perhaps you knew one of the authors or illustrators or even someone who worked in a factory manufacturing the actual books. The possibilities are endless and I hope that you would care to send me an e-mail with your story or perhaps even join us at one of the many Three Investigators on-line discussion forums. Anyway, enough with the introduction, I have carried on far longer than even Alfred Hitchcock himself would dare. So without further delay, please go back to the Home Page, the site is about to entertain and inform! 309 Franklin Street, Cape May, New Jersey. The house in which Robert Arthur lived from 1963 - 1969. This is where he wrote all of his Three Investigators books. Photographed on Monday August 12, 2002. Welcome to The Three Investigators (T3I) Series U.S. Editions Collector Site! This site is the culmination of my interest/obsession with The Three Investigators which began in 1975. When this site went on-line in 2000, there was very little accurate or useful information available anywhere on collecting this series as compared to other popular juvenile series. Prior to the formation of this site, I had been posting much of my information and findings at the Jones Salvage Yard Forum. Now, several years later, there are many excellent sites devoted to this series. You will want to bookmark this site and check back often as I am an active Three Investigators enthusiast who is always seeking and finding out new and exciting information about all aspects of The Three Investigators. This site is where I will make any new information available first. Consequently, you will find this to be a dynamic site with frequent updates. While I would like for this site to be the final word on collecting The Three Investigators, this is impossible. Your comments, suggestions and any information you might care to offer are appreciated. Any new information which adds to the known body of knowledge will gladly be credited to the contributor. The information contained on this site comes from my personal study of this series. I either own the material (books, artwork, documents, etc.) from which this information was obtained or I have been able to personally verify it through other means. Every effort has been made to ask for and then give proper credit to those whose information has been used even if it falls into the public domain and their permission is not legally or ethically required. I believe this is the honest and right thing to do and feel very comfortable guaranteeing the accuracy of the information you'll find here.